It’s March. Spring is just around the corner and we’ve got an adorable, bonded pair as our Dogs of the Month! Edith and Archie love hanging out with their people. Cuddling on the couch, or going for walks. They do just fine on a double lead. When they came into rescue they had those nasty heartwormies. But they continue to improve with treatment. 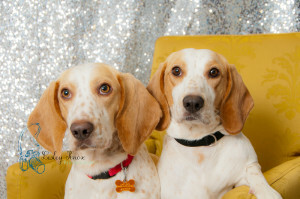 Update: Edith and Archie are now heartworm free! If your looking to start the new season off with a couple of awesome new family members you can fill out an Adoption Application. Want to find out more about Archie and Edith? Then check out their bio. This entry was posted in Dog of the Month on March 3, 2015 by Richard.